what are the parliamentary candidates’ views on legalising marijuana? Although we are against the use of recreational drugs and we’ve witnessed the negative results, this seems to be the lesser of the evils facing lawmakers. Two years ago the Kapiti council voted to allow the sale of ‘legal highs’ or certain synthetic drugs in the district — see this Joel Maxwell story on the stuff website. Synthetic marijuana has made the news in the last couple of weeks because of the disastrous effects it has on those who smoke it. The government can ban it, but to make their substance legal again the manufacturers just need to alter the formula. We’re told that the real stuff is getting hard to obtain, so consumers simply switch to this. In the 1980s the Reagan administration in America declared war on drugs, but over 30 years later it’s a war that has not been won. In the U.S. a lot of the drug trade is controlled by the Mexican Mafia; here’s it’s often controlled by gangs. Needless to say, it’s very profitable. Rival gangs fighting over the same territory sees a lot of violence; while users wanting money to pay them resort to theft and burglary. At the time of the 2012 Presidential elections, Colorado and Washington states voted to legalise marijuana and these states have since been joined by Alaska, Oregon, California, Nevada, Maine and Massachusetts. They are not free of restrictions, though: California’s Prop. 64 measure allows adults 21 and older to possess up to one ounce of marijuana and grow up to six plants in their homes. Other tax and licensing provisions of the law will not take effect until next January. From a financial viewpoint, it’s been good for these states; they collect sales tax and the ‘dispensaries’ have to pay normal business taxes — before they collected nothing, if you exclude the stashes of cash sometimes seized by police. Smoking anything isn’t good for you and there should be healthy ways to get natural highs — from exercise or, for former mayor Ross Church, driving a powerful car while listening to Led Zeppelin. But there are always going to be people who will seek quick escape from drudgery with a drug, be it alcohol, tobacco or pot. It’s better for it to be subjected to supervision than in the hands of the black market as prohibition doesn’t work. As has been made clear on social media, Kapiti residents who live near the ‘Ewy’ are unhappy about the amount of noise that traffic produces on it, and this stuff article appeared on Saturday about it. The average night-time noise level is 67 dB, above the 57 dB which is required by the resource consents that were issued for the ‘Ewy’. Although we can’t hear it where we are, we well know what it’s like to experience protracted, excessive noise, and sympathise with those who can. We looked at this issue before it opened in this post from last September and said that a continuous unbroken wall is needed to reduce it effectively. 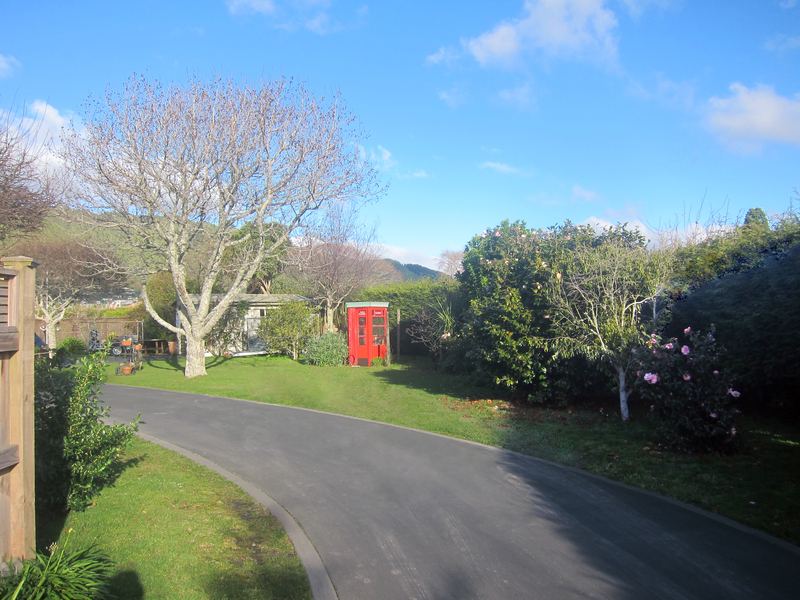 An old red Post Office/Telecom box of British design but now just a garden ornament, not for public calls. The universal proliferation of smartphones has now all but rendered phone booths obsolete. Here’s a gallery of a Tauranga company which restores and sells the British ones. a question for parliamentary candidates: how likely is it that a Kapiti Hospital will get government funding? The petition for one was launched by Mayor Guru 12 July and the official website for it is here. Capital & Coast District Health Board, whose territory includes most of Kapiti (except Otaki), runs two hospitals for Kapiti people: Wellington City and to a limited extent, Kenepuru just south of Porirua. “Increasing demand for health services, both through our hospitals and in the community, means we must invest resources in the right services, in the right place, at the right time. “We also provide outreach services in Kapiti for around 18 specialities, as well as diagnostic services, which can be done in the community and do not require a visit to hospital. Reading between the lines, this basically says no hospital. The board is said to be highly cash strapped with what it has to run already. But, there is another possibility: two days before Mayor Guru launched the Kapiti petition, this story in the NBR reported Wellington property developer Mark Dunajtschik’s bankrolling a new $50 million Wellington children’s hospital which will be 7,000 sq metres, three storeys tall and have 50 inpatient beds. There are wealthy property businessmen in Kapiti who could easily make the same kind of donation, but would they? We’ve been told about a house close to (but not part of) the Winara Retirement Village where the owner left the front door unlocked for a tradesman. But some opportunist thief visited first and stole some valuables inside. Regrettably, the elderly are magnets for lowlife who see them as soft targets, and the thieves may not just be satisfied with the residents of these establishments, but will try neighbouring properties as well — as we have discovered ourselves. 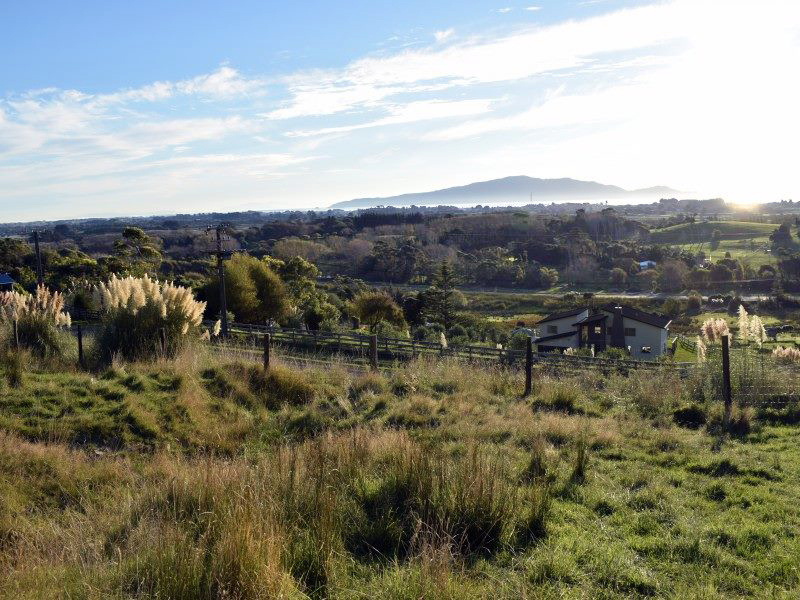 Greater Wellington Regional Council works with volunteers to plant up to 25,000 trees a season and needs your help! Join the GWRC this year and help achieve the goal of planting 25,000 trees a season. You make the difference. Join in at the MacKays Crossing entrance at Queen Elizabeth Park for a morning of tree planting Sunday at 10 AM to 2 PM. The weather is predicted to be sunny. There will be a free sausage sizzle and live music! Please bring appropriate footwear and warm clothes. This was scheduled for last Tuesday, but it seems it was postponed due to illness by one or more of its members. 3. the positioning of that welcome sign. We’ll comment more on the Maypole company development soon, and the siting of the new bus stops when they are confirmed. 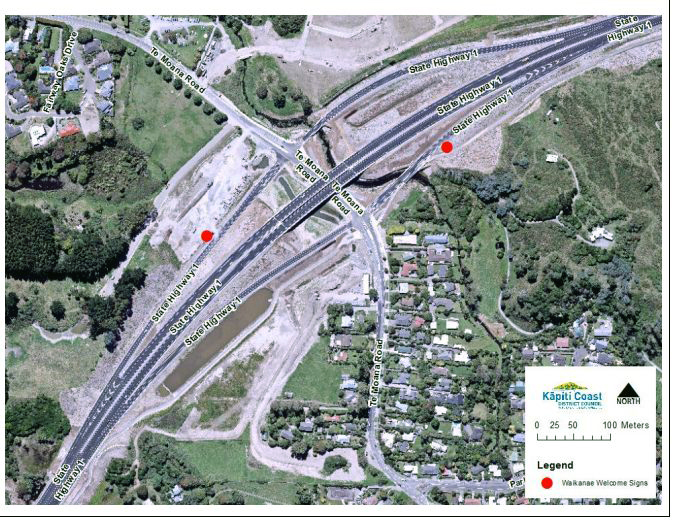 The document for the ‘Welcome to Waikanae’ signs shows the possibility of putting them on the northbound and southbound ‘Ewy’ off-ramps, where the red dots are on the map below. This would require permission of the NZTA on whose land they would be and Resource Consent, presumably from the central government. The other option is simply to place them where the hitherto existing signs have been on SH1. It would make sense to have both. In an earlier post we included a photo we took in Paris of a garden up the side of a building: this one is on an even grander scale. The garden up the facade of a 16-storey apartment installation was designed by French botanist Patrick Blanc in collaboration with Paris-based architects Ateliers Jean Nouvel. All of the plants and flowers in the vertical gardens are carefully maintained by a special hydroponic system, which automatically waters them. 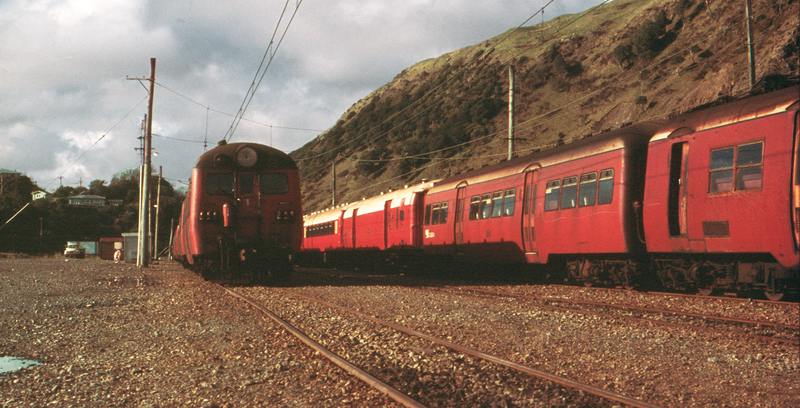 These English Electric multiple units (supplemented in peak hours by locomotive hauled carriages visible in the centre) moved commuters from Wellington to Paekakariki beginning in 1949. It wasn’t until 1983 that the wires were extended the 10 km to Paraparaumu, and not until 2011 another 8 km to Waikanae. The extra 15 km from Waikanae to Otaki can best be described as “under discussion” and is a Wellington Regional Council matter together with the central government.